I love Thanksgiving. We host the dinner at our house, and I love having friends and family around. The more, the merrier is our motto so we need a big space for dinner. 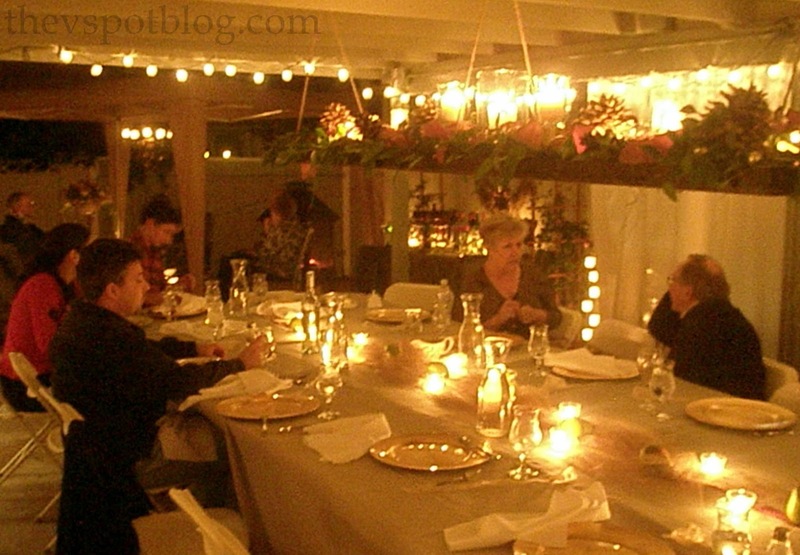 We set the dining room up as the buffet and everyone eats out on our patio. (Fortunately, Southern California weather usually allows us to do this.) I love to do something big and spectacular as far as centerpieces and tablescapes go. You can use whatever size board you want. The base of this is about 18 inches wide by 7 feet long. I can’t remember if this was built to specific measurements I gave HH, or if this is what he had on hand. Either way… Once the base is cut, frame it out with 1 x 2 and then add a bit of decorative trim. Stain it or paint it. (Or don’t. It’s up to you.) Put an eye hook in each corner for hanging. We added them in the middle for added stability because it was so long. 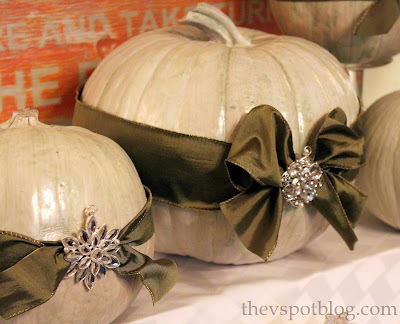 I’m going to use this again this Thanksgiving and incorporate these green, blinged out pumpkins. I’ll show you how it turned out later this week. My utility room is definitely the room that needs the makeover. My garage needs some major organizing and tidy up! My bedroom! It hasn’t had anything done to it in the ten years I’ve lived here! That hanging centerpiece is gorgeous Vivienne!!! You always come up with the most creative ideas. 🙂 Our garage could use a makeover for sure and I’m seriously over my green carpet. LOL! My living room. I need more seating because the family won’t visit! Um, my kitchen area which is going to be a craft area – when the boxes are gone . . This is absolutely gorgeous! You did a wonderful job! Have a Happy Thanksgiving! 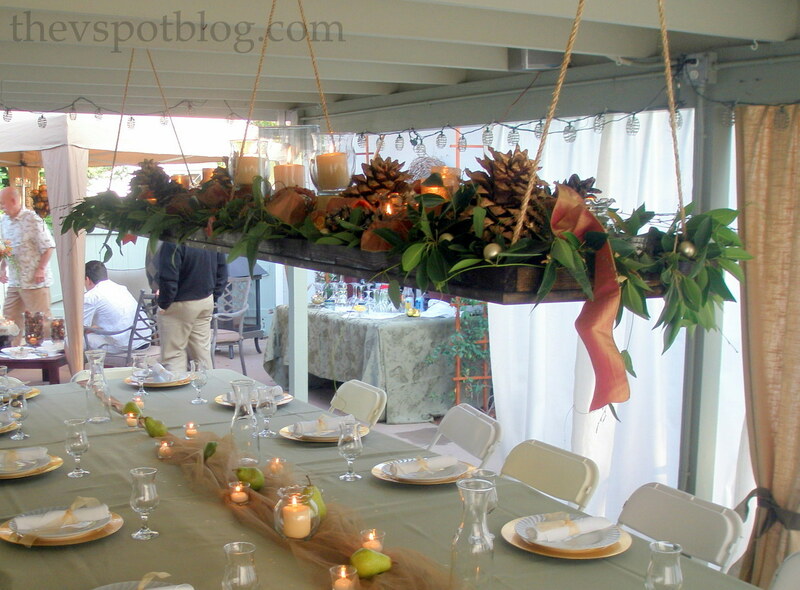 Floating centerpiece = EPIC GENIUS!! The bedroom of my 2 youngest son’s definitely needs a makeover! my main living room could definitely use a makeover. I started with browns and neutrals for the big pieces of furniture, but I don’t know where to go next! My family room is in desperate need of a makeover…it’s top on the project list for 2013! 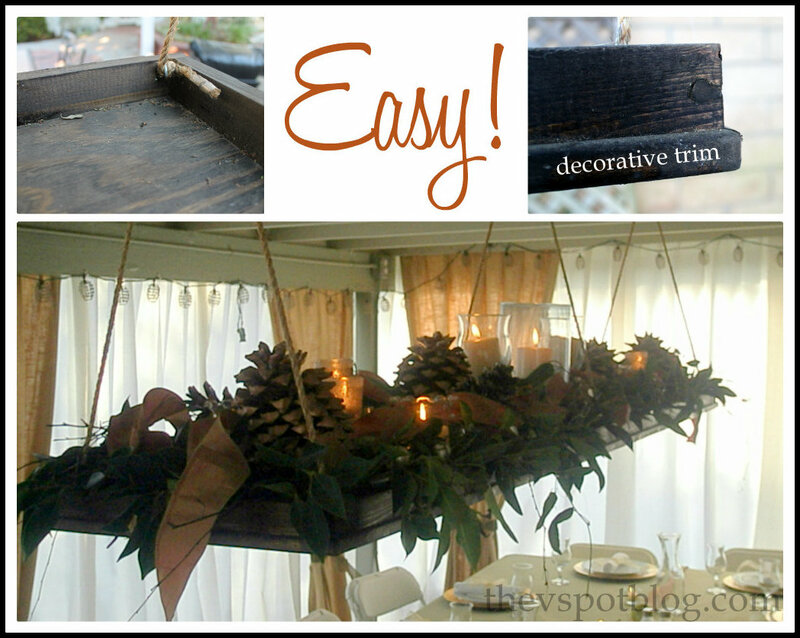 I love that hanging center piece. & also love living in Southern California with the warm weather for Thanksgiving. We also end up eating outside a lot this time of year. Viv! OH MY GOSH! You outdid yourself. This outdoor room is positively magazine worthy! I am beyond impressed! And I love Ace Hardware! My living room is in desperate need of a makeover. Your centerpiece is gorgeous!! I need help organizing our spare bedroom/my dressing room/closet. We love Ace! My kitchen is in most need. Too many knife nicks in the linoleum.